Well, it was entirely predicable that Ricardo Morales, when he switched to Uebel, not long ago, would sooner or later collaborate with them to produce a new model clarinet. What was not predictable was just how fast it has happened. Evidently he introduced the Zenit clarinet at a trade show in Japan in December and a certain number of them have been produced and are ready to go. Some photos have appeared with Ricardo holding the mopani version. Anybody see these instruments in the US yet? Has anybody tried (or bought) one yet? I've seen a photo of Giora Feidman holding this model, I believe. The Zenit is expected to made its first formal appearance in the US at the NAMM in California this month. It's very short, and the clarinet sounds unpleasantly shrill, but it has been recorded very close up and the tone may sound better out in the audience area. Not much to be learnt from the video, but there it is. Thanks. We should point out that the clarinetist in this video is evidently Mr. Yos Vaneesom, not Ricardo Morales. Interesting looking horn. Actually taking into consideration that the sound was recorded off someone's GoPro in the guys face, I think it came off pretty good. There is a video of Ricardo playing this new clarinet on Uebel’s Facebook page. He sounds wonderful. Ok, bad video quality.......I think we all WANT to see the horn too. From what I can tell (not very well) the horn Morales is using appears to have a ring on the bell and I don't see the vent hole. Of course, if Uebel says its the new Zenit then I guess it is. Ricardo is great no matter what. Just wish they posted in HD. Here's the same video but in better quality. 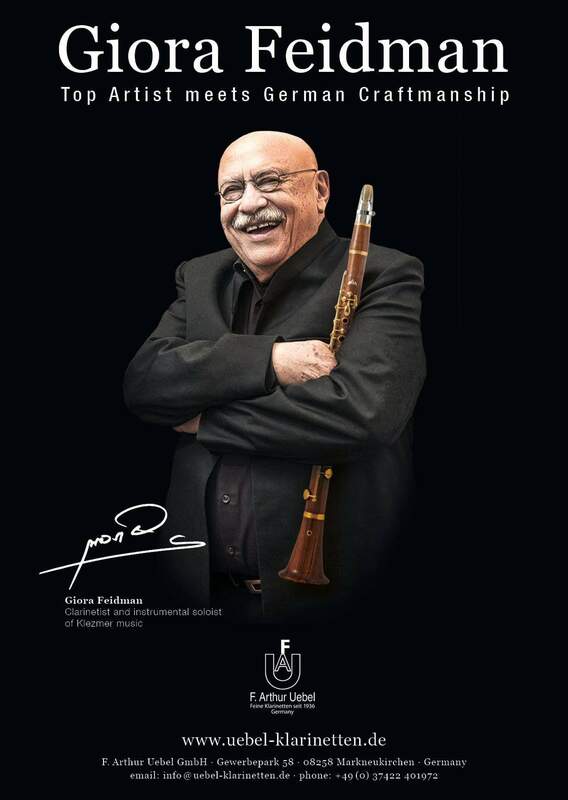 Re the original Post, yes, Feidman now apparently plays on a 24K gold mopane wood Zenit clarinet. See the attached photo. I still don't get Uebels Information and distribution strategy! They continuously update their FB page (from where I've taken the photos), but there's still basically no Shop I know of in Germany with a complete collection of their Boehms clarinets (eg the Superior Eb can possibly only be found at Howarth of London , the Advantage is out of stock everywhere, their new "Excellence" is listed on their website, but again completely unavailable). Great follow up guys, thanks! Don't get me started on the distribution aspect. Bottom line though is that they are indeed much smaller than Buffet. The interesting thing about them is that as a German based (owned) company, they have put their upgrade efforts into the Boehm/US market. As far as I know they have not yet attempted to make an Oehler flagship model. As for distribution, they started trying to get their product in local stores in the US but then opted out for an internet order only business model (about two years ago). I think that's where is stands now officially. Whatever they are currently doing, I think they may find that keeping up with demand may be their biggest problem. And will that be reflected in future pricing???? 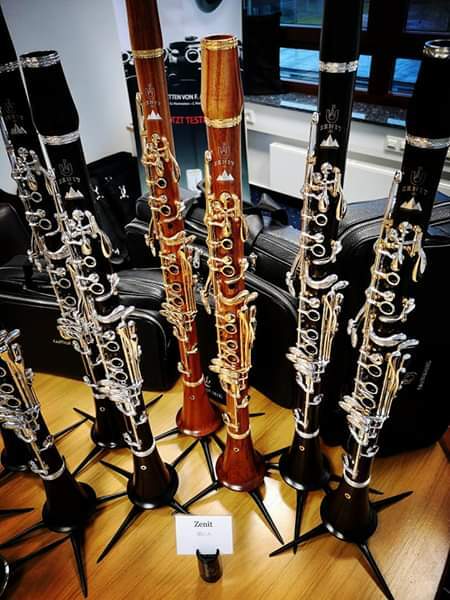 Since Boehm clarinets ought to be marketed outside Germany and since Stoelzel, the company behind Uebel, is a distributor for many brands, they may have great preconditions for outsourcing their clarinet manufacturing. It's evident that at least on their German system clarinets, only the final assembly is done in Germany. One might presume that their high-end Boehms cannot be produced in sufficient quantities, yet. He's holding a Zenit in this pic. This whole situation is getting a bit fishy. In addition to that, they've also released another model, the "Romanza". Maybe this is how clarinet making works nowadays, engage with as many artists as you (by any means...) and name 1-2 models after them, so people believe the clarinet has been reinvented. Again. Thanks, social media. Better just wait for this all to blow over and see wether I'll find 2-3 different models in a music store, there is no use in sticking a great name on your instrument and making it look as flashy as possible. At least Leiter&Kraus or other serious German makers haven't started "modern marketing" yet. Anyone know what "Zenit" means? Rossi sells a "Cenit," which has no middle joint. Is this also one-piece? The pictures make it look almost more like well-oiled boxwood that any mopani instrument I've seen. No, other pictures on their FB clearly indicate it has a traditional 2-piece body. Thanks! Google says "Zenit" is "Zenith" in German, which makes sense, at least until they come out with another model that's even higher (priced). Anyone going to NAMM should get a chance to try one. Moe & B says they will officially be out and on sale at that event. They will also have some at their showroom in Pottsville, PA by then. Does anyone know what mouthpiece Mr Morales is playing in the clip? The only thing more thing more smoother and richer than Morales' playing is chocolate... but yeah wow that new model of clarinet seems like it's very elaborate and refreshing. https://www.ricardomorales.com. (Scroll down below "Events" to hear it). I think I see gold posts in the video, but that "mountain" logo for the Zenith is pretty clear. I know a few folks going to next weeks NAMM (the Uebel booth is right next to the Buffet booth..........is that like having a Burger King across the street from a McDonalds?). Hopefully I will hear some sort of review on it next weekend. distributor....and it is associated with Ricardo himself. My repairman...Larry Frank is now in the process of opening a showroom where instruments can be tried out. He is now the official go to adjuster for Vienna Music company, which will be supplying the instruments. He does Ricardo's instruments now and those of Ricardo's students. BTW....Ricardo has been responsible for complete design changes to the new clarinets, which are the Zenith and the Romanza. The bad news....they run about 8 grand each. He played on his new model with his Philadelphia Orchestra last month, the Weber Second concerto, sounded fantastic. After the concert I went back and talked to him and played the clarinet, it's beautiful. The manager of Uebel was there as well to talk to him about any last minute "adjustments" he was going to suggest. He told me it was just about ready to be released and would not be "mass" produced. Prices are relative. Most symphony players (other woodwinds, strings) would be very happy to pay only 8 grand for their instrument. But then again, at that price I won't be rushing out to buy one either. Somehow eight thousand dollars doesn't sound like much to me, a bass clarinet already costs more that that but that doesn't mean the average orchestra player already being happy with thier clarinets will be running out to buy a set. If I weren't retired and was looking to upgrade I'd certainly give them a go. Heck, the last clarinet I bought was a Bb Selmer in the later 90s for $3,000, some models and brands where selling for much more than that, and we're talking 20 years ago. Here's a somewhat realistic Price list of ALL current Uebel clarinets. So a gold plated, mopane Zenit costs as much as a regular Lumiére. Makes Uebels Bass seem pretty cheap, haha! Also under the heading of "keeping it real," the Uebel Advantage is one amazing horn.....if you haven't tried one yet, you should. I got to try one today! They are indeed gold posts, so the whole effect is a two-tone look. The silver rings connecting the joints have a decorative design as well. I was at a local Maryland clarinet symposium and Uebel had a booth there. I really liked the instrument, but this was my first time trying any Uebels. I liked a couple of the other (less expensive) models almost as well. The ones i liked had a more free blowing feel to them and a nice tone. I liked them better than the high end Buffets I tried, but of course there was only one model on a peg, so given a range of instruments in a room, I might have a total different experience. I was just looking for fun, so didn't try anything for long.